Abigail Buglass studied Classics at Edinburgh for her undergraduate and master's degrees, and later Trinity College, Oxford, for her doctorate. Her thesis explores the didactic and rhetorical function of the frequent and often extended verbal repetitions which can be seen in Lucretius' De Rerum Natura. Towards the end of her doctoral work she spent several months in Munich as a visiting scholar at Ludwig-Maximilians University. In 2014 she also spent time as a visitor at Columbia University, New York. 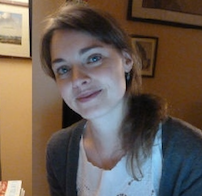 In January Abigail Buglass will take up a Postdoctoral Fellowship at the Institute for Advanced Studies in the Humanities at Edinburgh to work on her next project, which explores the late antique reception of Lucretius' De Rerum Natura. Her main research interests are Latin didactic poetry, especially Lucretius, Lucretius' later reception, and epic poetry.